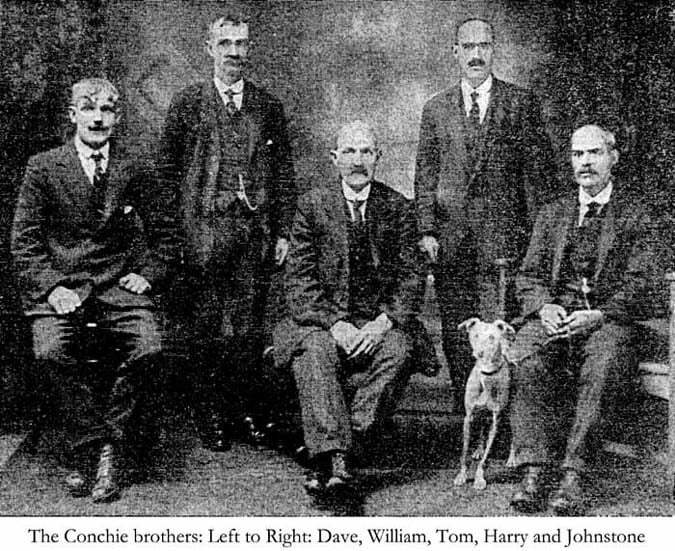 Conchie dominated the Grasmere Sports Guides Race from 1894 to 1900 and was also a highly successful grass track runner. His younger brother Charlie also competed on track and Fell, but was handicapped by having only one arm.Tom was born in Shap in 1873 or 1874 and was the eldest of nine children, five of whom turned out to be sportsmen..
Charlie was born at Shap in 1875 or 1876. Robert was an 'up coming young runner', but was killed in the Dardanelles aged only 19. Harry was a successful Cumberland and Westmorland style wrestler. Johnstone was a racing cyclist. The family was of Scottish descent and hailed from the Dalbeattie area. The original name of the family was McConchie, but their father paid to have the 'Mc' removed.Tom stood six feet two inches in height and weighed fourteen to fifteen stone. His size reflected the job he had at Shap Granite Works. Billy Henderson the weighman at the quarry recalled: 'He broke up slabs of granite in the quarry for the crusher with a 27lb hammer'. Tom encouraged Billy to start running and he trained him as a sprinter to become 'one of the best known sprinters in the North of England'. Tom gained a wide reputation on the grass track himself and once defeated the famous runner Fred Bacon, holder of the World One Mile and One Hour records, in a two mile track race in Scotland. He came second in the mile at Grasmere in 1895 on the occasion of his second Guides Race victory. He won both events the fiollowing 2 years and in the 1896 race up Silverhowe, set the record of 14 minutes 26 seconds which still stands today. An injury prevented him from competing in the 1898 Guides Race, but it did not stop him winning both the Open and the Local Mile. His brother Charlie was placed 3rd in the Open event. In 1899 Tom finished 3rd in the Guides Race, but again won the Local Mile, whilst brother Charlie came 2nd in the Open race. 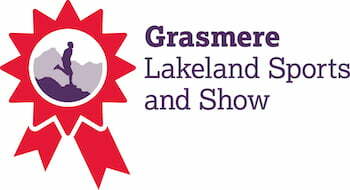 Tom won his 5th and final Grasmere Guides Race in 1900, and also completed a hat trick of victories inthe Local Mile. In the 1901 Guides Race he finished 2nd to the up and coming John C. Murray of Falstone (right), Northumberland. 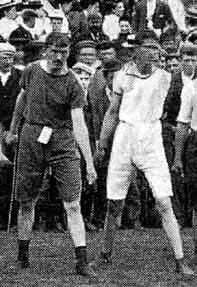 Murray was to become a keen rival of the younger Keswick runner Ernest Dalzell (below right) Tom achieved 7 consecutive victories at Pooley Bridge Sports, where runners had to ascend Heugh's Scar over a course which was more cross country than a true Fell Race. He also had 6 consecutive victories at both Keswick August Bank Holiday Sports and the Bowness Gala, where the Fell Race turned on Brant Fell. He could have increased his tally of wins at Keswick had he not failed to round the flag on Latrigg on two occasions. On the first occasion he was first back but was disqualified. The second time, someone pointed out his error part way down on the descent, and he lost so much time returning to the summit to correct his mistake, that he didn't even finish in the placings.On one occasion he won 9 events in one day, including 2 Fell Races at Hellafield and Gargrave, some 5 miles apart in the Yorkshire Dales. Tom was a good friend of the most famous patron of Grasmere Sports, 'The Yellow Earl' - Lord Lonsdale, who did so much to clean up boxing and introduced the Lonsdale Belt for British Boxing Champions. Tom often gave exhibition runs at Lowther Castle Tom and Charlie Conchie (see right - on right with left arm missing) at the start of the Grasmere Guides Race 1895. Tom Conchie won near Penrith. Charlie Conchie lost his left arm at an early age (in white - at left), but exactly how is still open to debate. Mr R. D. Conchie of Sedburgh said: "I've heard several stories of how Charlie lost his arm, these include hooking a bag on a pole for the mail train, picking up a parcel of newspapers, and having his arm cut off by the engine when he fell on the line". A long article on the Conchies in the Penrith Observer, January 13th 1953, also claims he was run over by a train, although Barrie Conchie (himself a fell runner) of Makinholes, Todmorden in the South Pennines, relates a differenet story. He had heard that his great, great uncle Charlie 'had his arm severed by the wheels of a hand operated truck in the quarry as a young child'. The same article quotes Tom Conchie as saying:"If our Charlie had wings (arms), he would have been a really great runner". It goes on to say that despite his handicap, 'Charlie became a great athlete. He was well known as a sprinter but better known as a jumper". He also competed in fell races, and often when Tom came in first, he would run back a few hundred yards and pace Charlie in to the finish. A letter in the Cumberland and Westmorland Herald from a Mr. J. A. Pallister of Penrith recalled that at one time, "the Conchies lived in a house near the Royal Oak Hotel Sleagill, and Tom used to train by running up Threaplands Ghyll with Charlie accompanying him as pacemaker". Sleagill and Threaplands Ghyll lie to the north east of Shap village. The brothers also trained on Shap Pike and often did exhibition runs for guests at the Shap Wells Hotel. Johnstone, their cycling brother, would frequently act as a pacemaker on training sessions. When his running days were over, Tom became manager of the Bull's Head at Shap, and later the Red Lion in Penrith, before moving to Waberthwaite in west Cumberland. He then moved to Clitheroe in Lancashire, in the shadow of Pendle Hill. He died in Carlisle. Acknowledgements: Barry Conchie, John Conchie, Mr R. D. Conchie and his sister Mrs M. Abbott.